Along with many thousands of Houstonians, our great Houston Symphony Orchestra [founded in 1913] was affected by the flooding from Hurricane Harvey that hit Houston a few weeks ago. Many of the orchestra members themselves or family members of the orchestra members faced adversity from the storm, like most of us in this fourth largest city. Also, their concert hall home in downtown Houston, Jones Hall, was damaged on the bottom floor; thankfully the main concert hall and the upstairs were not damaged at all and in the near future the repairs should be made so that patrons can once again hear our world class symphony orchestra in Jones Hall. The traditional opening night concert last week had to be postponed, and the next two concerts will be performed at Stude Concert Hall at Rice University. Thank you so much, Rice University, for such short notice to graciously accommodate our orchestra to perform the first concerts there. The fetching Mrs. Sheralyn B and I will be attending the HSO concert on Sept. 23, 2017 at Rice University. Hopefully, we soon will be able to attend our home away from home, Jones Hall, to hear our next scheduled concert. Here is a short video on our Houston Symphony Orchestra from a couple years ago, and then I hope you will enjoy the Tales post following this short video, that was first published 3 years ago welcoming our great dynamic young Maestro Andres Orozco-Estrada as our new director of the HSO. The excitement begins as this week Maestro Andres Orozco-Estrada changes from the title of director-designate to becoming the official 16th director of the Houston Symphony Orchestra. The first official concert under this exciting young conductor's baton at Jones Hall in Houston will be one week from today-Sept. 13, 2014 as the exciting 2014-15 season officially begins. The fetching Mrs. B and I have been so lucky to have seen Maestro Estrada this last season, as the director-designate. And I say without hesitation, Maestro Andres Orosco-Estrada will take our world class Houston Symphony Orchestra to even greater heights. This man brings youth, excitement, and a love and interpretation of the great masters music like I have never seen. Andres Orosco-Estrada, and the Houston Symphony Orchestra under his directorship will make all of Houston proud. Because Maestro Estrada officially becomes the director of the Houston Symphony Orchestra, I would like to do this repeat post from January, 2013 when Maestro Estrada was chosen as the director-designate. The great Houston Symphony Orchestra has been lucky to have some great conductors in its history. Some of the more well known greats of the 15 music directors Houston has had in its history have been: Leopold Stokowski, Sir John Barbirolli, Andre Previn, Christoph Eschenbach, and currently the beloved Hans Graf. Maestro Hans Graf took the podium in 2001 and Houstonians have been so lucky to have had his leadership of our Houston Symphony Orchestra for over a decade. Hans Graf ended his tenure last season and Mrs Sheralyn B and I, as subscribers to the Houston Symphony concerts for many years wish to say thank you Maestro Graf. You have brought us much pleasure with such beautiful music. We wish you the best Maestro Graf! 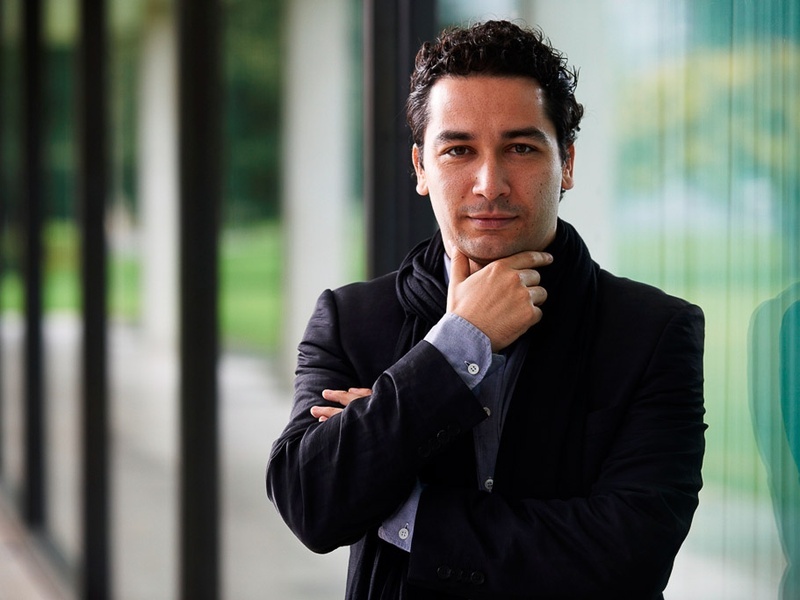 In January of this year  it was confirmed that the Houston Symphony Orchestra has chosen its 16th music director: Maestro Andrés Orozco-Estrada. Orozco-Estrada [a violinist and conductor] is thirty six years old from Colombia and has an international flavor as he was trained in Vienna and has led many of the great orchestras, like the Vienna Philharmonic. He will officially take over in Houston with full responsibility at the start of the 2014-2015 season. Orozco-Estrada upon learning of being chosen was very excited and said: “I feel such great chemistry with the orchestra and with the city already. I can’t wait to get started.” If I may speak for the many lovers of the Houston Symphony Orchestra, the feeling is mutual Maestro Estrada. Tales welcomes and congratulates the newly chosen music director of the Houston Symphony Orchestra, Maestro Andres Orozco-Estrada. 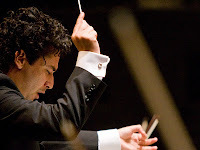 While Maestro Andres Orozco-Estrada does not officially take over his reigns as director and conductor of our wonderful Houston Symphony Orchestra until the 2014-2015 season, he will make many appearances this season as the Houston Symphony Orchestra designate. There is a lot of excitement in Houston to see our new young and exciting Maestro. This is really going to be some special treat for subscribers and all attendees of the Houston Symphony concerts. Watch the youthful, dynamic Maestro Andres Orazco-Estrada as he conducts Mozart's lively Marriage of Figaro Overture and the final movement of Rachmaninoff's ultra beautiful 2nd piano concerto. So, you will get to see him conduct a classical music piece and a Romantic era piece. I think you will understand why Houston is so excited about our new director for our great symphony. Please turn up the volume and watch in full screen Houston's great new Houston Symphony Orchestra director-Maestro Andres Orosco-Estrada. This first video I suggest you don't just listen to this grand music, but also watch the love you can tell our new Maestro has of the music flowing from the expressions of his face. Very well written! Thanks Mike for bringing him to the spotlight. Congratulations to Maestro Andres Orozco-Estrada. Houston is lucky to have you!